The swimming Pool water chemicals balanced at an S&R pool opening are PH , Total Alkalinity, Calcium Hardness and Stabilizer. If these chemicals are not in balance, your initial chlorine shock treatment will not be effective and potentially do damage to your swimming pool’s equipment and surface. S & R Pools & Spa cannot stress how important this is to start off your season! The PH tells us how acidic the water is. Low PH can damage your pool equipment, burn your eyes and drastically decrease your shock and chlorine’s effectiveness. If a pool is shocked with low PH it can bring the metals out of solution and stain the pool plaster or vinyl liner. Total Alkalinity An acceptable Total Alkalinity level is 80-120 ppm for a concrete pool and 125-175 ppm for a vinyl liner pool. Total Alkalinity keeps your PH in check. If your total Alkalinity is not in balance you get PH bounce. The PH test reading is not accurate. It shows very high and then very low, with neither reading being accurate. This effects your PH and if a pool is shocked with low PH it can bring the metals out of solution and stain the pool plaster or vinyl liner. Calcium Hardness protects your pool equipment and pool surface. Low calcium makes the water acidic and the water pulls the calcium it is looking for out of your pool surface and the result is premature failure of your plaster finish or your vinyl liner and your filters, pumps and plumbing system. 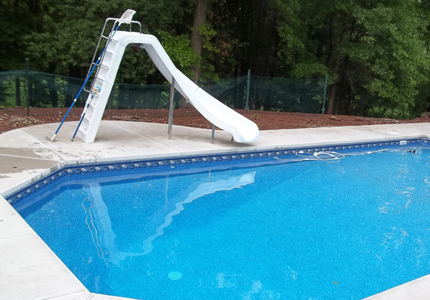 Stabilizer An acceptable level for a pool sanitized with a chlorine product or a bromine product is 40-60 ppm and 80-100 ppm for a salt water pool. Stabilizer protects your chlorine from the sun. Proper levels put a shield between the chlorine and the sun. Low Stabilizer level allows the sun to feed on the chlorine. A low Stabilizer reading will result in the use of a much greater amount of chlorine because it is not protected by the Stabilizer shield. If your pool is outside and sanitized with Chlorine Tablets, Bromine, Gas Chlorine or Salt your pools chemical levels should be maintained at these levels. False: It is true your stabilized chlorine tabs have a small amount of stabilizer in them, but this is not nearly enough to satisfy the initial demand required. The amount in your tablets is an estimate to maintain the level thorough the season. False: Not all your balancing chemicals clear your water. Some chemicals protect your investment such as filters, pumps, motors, valves , seals, heaters, heat pumps, vinyl liners, plaster finish, handrails, ladders and many more. Clear water can be eating away your investment. False: The 2 main reasons your eyes burn in your swimming pool is low PH and chloramines are present. Low PH is simply raised by adding PH Increaser. Chloramines are the byproducts of chlorine. Chloramines are exhausted chlorine that did it’s job. The way to get rid of Chloramines is to super chlorinate or shock. The cost of balancing chemicals can be 0 or $100. It is impossible to know what your pool water requires until it is tested, but what we do know is that if the balancing chemicals are not in balance, you can use between 3 to 5 times more of your sanitizer, such as chlorine, bromine or salt, annually. We also know balancing chemicals are a great deal less expensive than sanitizers. We also buy our chemicals in bulk so the great price savings for purchasing in bulk gets passed down to our customers. Balancing your swimming pool water chemistry is the proper procedure to provide you with a trouble free, cost effective swimming season. Balancing your swimming pool water chemistry will save a great deal of money. Balancing your swimming pool water chemistry will maintain the proper levels in your pool to protect your investment. Balancing your swimming pool water chemistry keeps your water clear and you will not lose any of our short swimming season to a green pool. Balancing your swimming pool water chemistry will keep your family healthy and provide comfortable swimming.